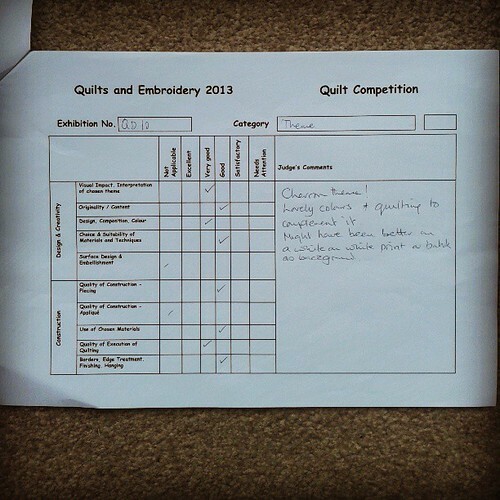 HEART OF CHARNWOOD: The Judges Have Spoken and The Bloggers Quilt Festival. 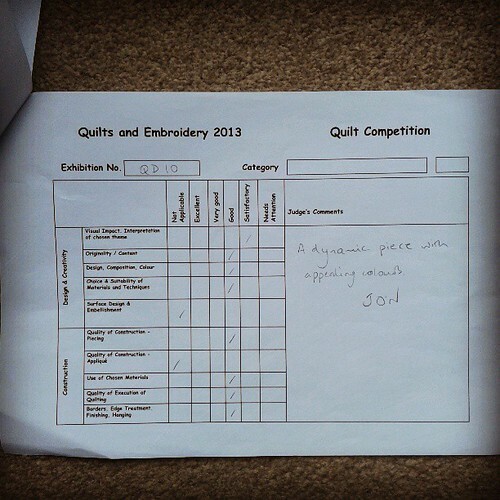 The Judges Have Spoken and The Bloggers Quilt Festival. With the return of my beautiful (I love it, so I'm going to say that, sorry if it sounds arrogant) Chevron quilt this week, came the grading from the judges. I had thought before it arrived that I might be a little sensitive to any perceived negative comments. Surprisingly enough, I've taken the comments all rather well (they went easy on me), I can even go as far as to say, I had a little chuckle at one or two of them. Overall I received all "Good" and "Very Good" across the categories, and the 3 judges, except one which was "Satisfactory" from one of the judges, in the category of Visual Impact, Interpretation of the Theme. Now whilst for Visual Impact I might disagree, I think it is a very eye catching quilt, but in relation to the category, Special Themes, New Beginnings, I'm not sure I had actually entered it in the most appropriate category, so i'll give them that. ;o). The same judge described it as "A dynamic piece with appealing colours" which I think is a really positive overall comment, and made me pretty happy- especially considering this wasn't supposed to be a "show" quilt, it started out as me off on a sewing tangent! Another of the judges commented that "A bit more quilting would have added a bit more to this, especially the background", and I can see their point, but I didn't want an over quilted piece on the actual chevrons. In retrospect, some quilting on the background white would have accentuated the chevrons, so also good feedback. Overall, I was pretty pleased with the feedback, some good, constructive, well thought out (on the whole) comments, and considering this was thrown together Improv style with no pretensions to being a show quilt, and that the actual quilting etc was thrown together at the last minute (in a total panic, and on 3 different sewing machines), not getting torn a new one about the quality of my work is a positive. I have a feeling the Festival Of Quilts judges wont go so easy on me, but hopefully my project for that one will be up another level, we'll see, maybe not! 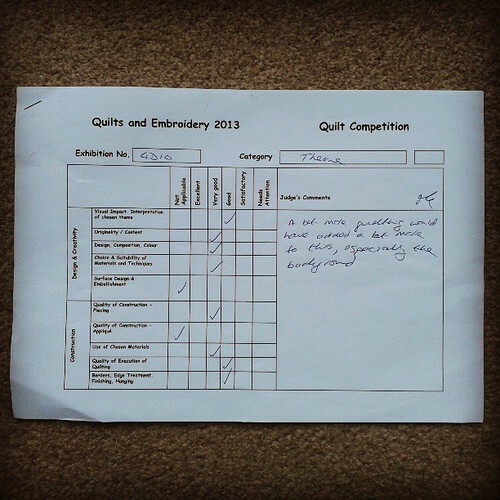 So with all of that loving in mind, I have decided to enter this one in the Bloggers Quilt Festival, there are some amazing quilts in the competition, and this is my first time emtering that too, go and take a look, I'm in the throw quilt category. Machine Quilted across the chevrons by me! Improv pieced from solids into squares, then cross cut and pieced to create a chevron effect. WTF! White on white or batiks? Is the judge on meds? It is a thoroughly modern quilt and most white on white fabrics are not particularly modern. And a batik background would have totally hidden the wonderful impact of the chevrons which was the whole purpose of the quilt. What a complete moron! Shall I tell you again how much I love your quilt? Because I do! My computer screen got a light spraying of drink with the batik remark - brilliant! 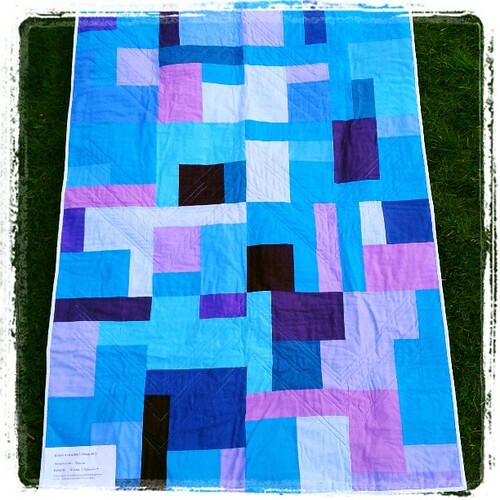 I love this quilt, it is has such presence for such soothing colours. I would not recommend a single change, your judges are tuned into another aesthetic. Surprised they didn't suggest a bit of sparkle and some maybe a bit of Civil War beige to top it off! Vomit - batiks...love your quilt just as it is and the white sets the colours off perfectly. 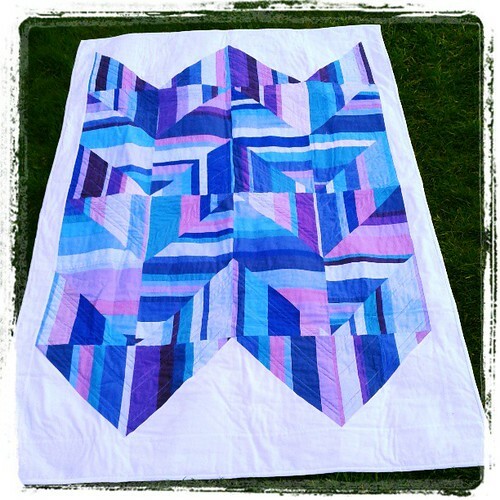 It's a fab quilt - despite it's lack of batik ;) - and I"m in awe of you entering it! I went to my first proper Patchwork & Quilting show on Friday and am starting to debate whether to enter a quilt next year. It feels a bit scary so we'll see. Euw - batiks *shudder*...what Susan said! I had a giggle at the Batik comment too. It's a wonderful quilt front and back. These are such gorgeous, soothing colors. It's a great entry. And kudos to you for having the nerve to enter into a judged competition - not sure I'm that brave yet! *guffaws* Your batik indignation comes through loud and clear!! But on the whole you got amazing comments , bearing in mind this was the equivalent of a Tchaikovsky afficionado judging a Daft Punk CD! I love it completely and totally. White on white is yucky and I hate batiks as much as I hate Aida for hand stitching and if you've ever read my stitching blog you will know I hate that a lot!!! But your quilt is very yummy. yours is such a pretty quilt :-) I can't believe how many people hate batiks though. Its all I can buy where I live in Indonesia - and there is such a variety in style, design and colour - its not all bad!